Talk on your smartphone with style and eliminate 99% of radiation emitted by your smartphone. It’s a classically designed retro desktop telephone that works with both your landline and your smartphone, including iPhone, Android, and BlackBerry. The base is handcrafted from real wood, and the metal is all authentic brushed copper. 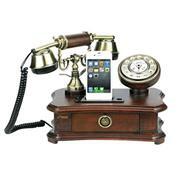 Now you can embrace the look of early 20th century telephones with modern technology One button pickup and transfer between your landline and mobile phone makes operating this phone a breeze. Standard telephone features include last number redial, flash function, and ringer high/low selection.